The Logo for Dandelion Books reflects its approach toward the art, craft and business of writing, publishing and marketing books. Dan-de-lion—"Daniel the Lion": In the Bible, Daniel was a prophet of Israel. He saw visions and dreamed dreams. It is said that a member of the Tribe of Dan will be the harbinger of a Golden Age. 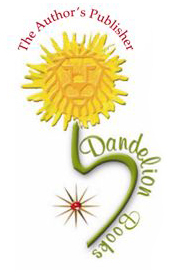 In the Dandelion Books logo, the stem of the dandelion is a "lamed," the tallest letter in the Hebrew alphabet. "Lamed" stands for Learning, Light, Love, Laughter and En-Lightenment: the characteristics of a Golden Age. The ruby-colored 12-pointed star on the Dan-de-lion's breast, is his heart. Dandelion is lion-hearted, embracing all people equally, with love and compassion. The 12-pointed star, a mandala, has its own mystic symbolism. The ruby gemstone symbolizes freedom, charity, dignity and divine power. "The price of wisdom is above rubies," says Job in the Bible. The lion in the center of the Dandelion flower has eyes that are meditative; they are both awake and asleep and they follow the viewer. Known for their sturdiness, Dandelions are not easily trampled on or uprooted. Dandelions and democratic and egalitarian. They choose their soil and location without prejudice. Dandelion roots, stems, flowers and seeds are known for their medicinal properties. When Dandelions transform from flowers to puffballs, only the slightest breeze is required for transporting these seed-wings to new locations. Wherever they land, they find what they need in order to thrive. In the spring, a field of Dandelions is a sight to behold. If you find a lion in your den, it might be a Dandelion book. Beware! It could be a wake-up call. 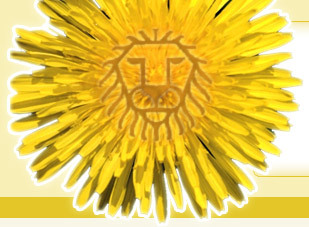 Dandelion Books is the only publishing company online with an On-Lion Logo.